This was a nice tour and a great way to see the city! This tour takes you on a discovery adventure around Phra Nakhon Si Ayutthaya – the Sacred City of Ayutthaya, founded in 1350 and proudly holding the title of the Siamese royal capital until 1767. 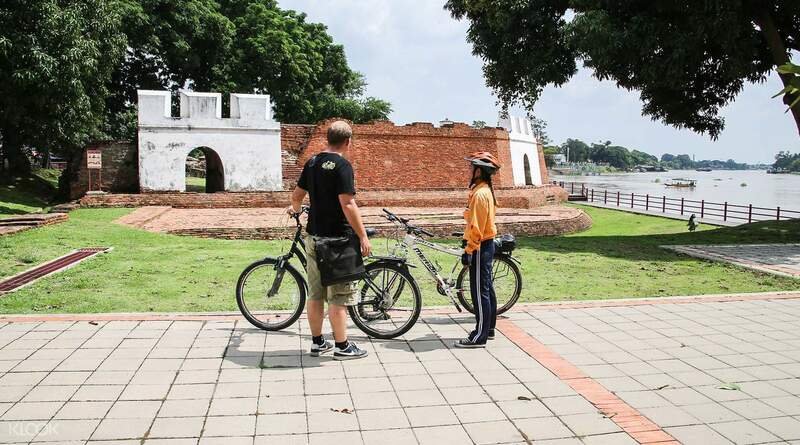 The first stop of the biking tour invites you to Pom Phet, also known as 'Diamond Fortress'. You will then explore local neighbourhoods on the way to 'Roti Road', where you will get to taste signature Thai delicacies recommended by your experienced guide. Cycle though the calm Somdet Phra Srinakarinda Park to the next stop at Chedi Phra Si Suriyothai memorial where you will have time to take loads of memorable photos before heading out to visit a Muslim community, Ayutthaya Historical Park and two of Thailand's well-known temples: Wat Phra Sri Sanphet and Wat Mahathat. 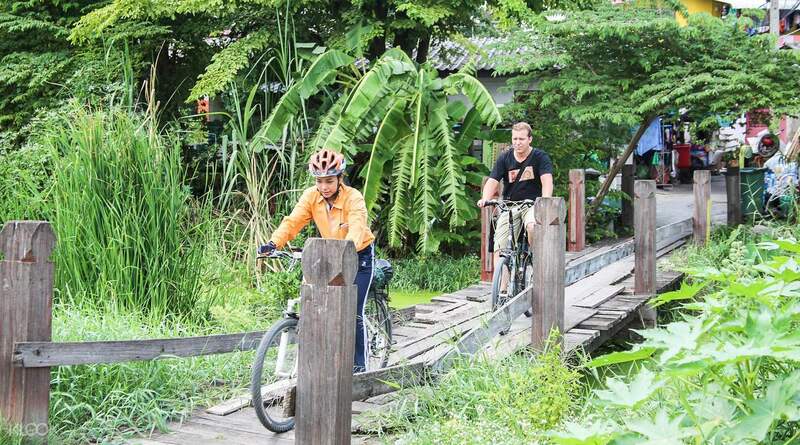 The Ayutthaya biking adventure concludes with a shopping spree at a local market and a ferry across Palak River before making your own way to your next destination. The trip was well planned. Sao - our guide was kind. An efficient way to get around Ayutthaya for a day trip if you don’t mind cycling under the burning hot sun. The trip was well planned. Sao - our guide was kind. 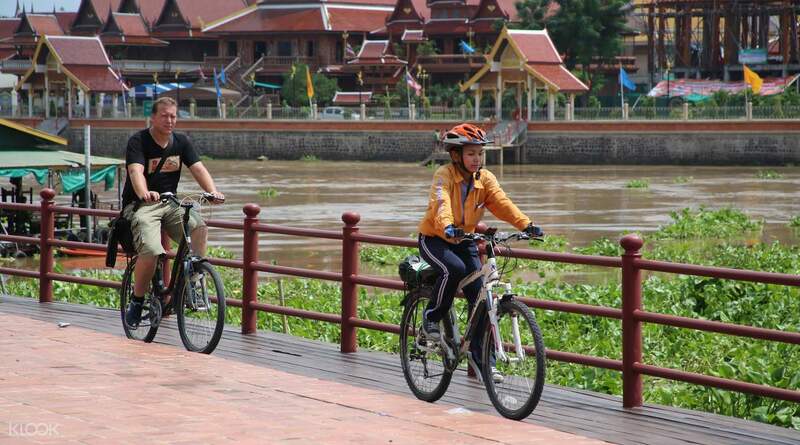 An efficient way to get around Ayutthaya for a day trip if you don’t mind cycling under the burning hot sun. An amazing experience! This is a good way to roam around and visit the temples. The guide was very nice and knowledgeable. I love the local delicacy we tried along the way! An amazing experience! This is a good way to roam around and visit the temples. The guide was very nice and knowledgeable. I love the local delicacy we tried along the way! This is another nice experience i had in Bangkok. The guide was really nice and is mindful of the guests' safety. Further, I believe that biking is the best way to explore the whole city since walking would be more exhausting and tuktuk ride is more expensive. The video coverage of the tour is also a plus and was sent 2 days after the tour. This is another nice experience i had in Bangkok. The guide was really nice and is mindful of the guests' safety. Further, I believe that biking is the best way to explore the whole city since walking would be more exhausting and tuktuk ride is more expensive. The video coverage of the tour is also a plus and was sent 2 days after the tour. Exciting and fun!! Our guide was really really good telling stories about the historic places we have visited and she was an awesome guide! Exciting and fun!! Our guide was really really good telling stories about the historic places we have visited and she was an awesome guide! We really enjoyed the three-hour bike ride. Compared to the other tours of Ayutthaya, we got to see almost all the major sites there. Our guide, Sao, was very helpful and knowledgeable. Her English is really good, too. Be warned that it can get really hot, so pack a towel and/or a change of shirt. Two bottles of water are provided by the tour operator. We really enjoyed the three-hour bike ride. Compared to the other tours of Ayutthaya, we got to see almost all the major sites there. Our guide, Sao, was very helpful and knowledgeable. Her English is really good, too. Be warned that it can get really hot, so pack a towel and/or a change of shirt. Two bottles of water are provided by the tour operator. This was a nice tour and a great way to see the city! This was a nice tour and a great way to see the city! Guide was well acquainted with the history of the different sites. Although cycling on the roads can be daunting at times, all emerged unscathed. Guide was well acquainted with the history of the different sites. Although cycling on the roads can be daunting at times, all emerged unscathed. Our guide was very helpful and ensured our safety during the ride. Our guide was very helpful and ensured our safety during the ride. I took a bike tour for 4 hours in the morning and it was good to see Ayutthaya all around. The viking guide was friendly and helpful. I have to go here next time. 자전거 투어는 오전 4시간으로 참여 했는데 아유타유를 전박적으로 둘러 보기에 좋았습니다. 바이킹 가이드가 친절하고 설명도 적당하였습니다. 다음에 여기로 가야겠습니다.